Way of the Passive Fist is an old-school arcade brawler with a big twist, but is that enough to overcome some troubles unique to the genre? Our review. 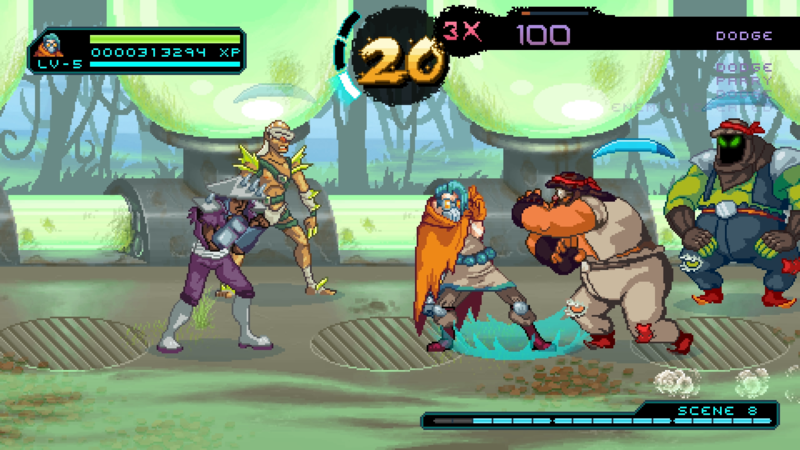 What happens when the concept of an arcade-style beat-'em-up brawler is turned on its head? Where the idea isn't so much to beat up every enemy on the screen, but simply let them tire themselves out? 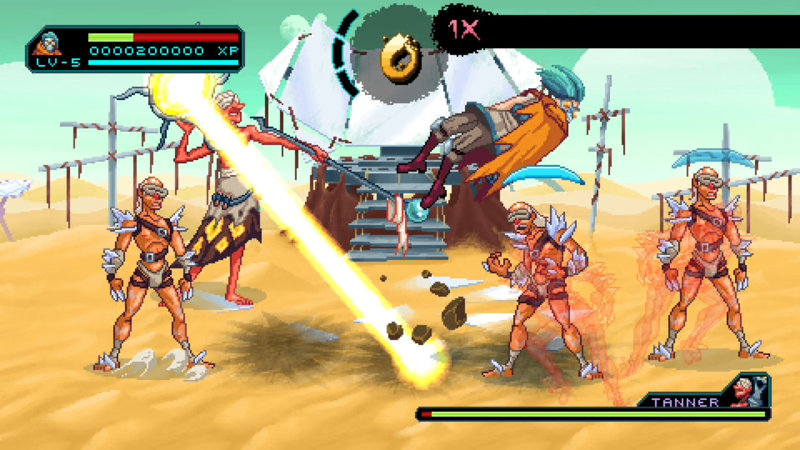 For Household Games, that concept has led to Way of the Passive Fist, the studio's debut effort. While I went into the game looking for more of an arcade brawler, I wound up with a more interesting rhythm game and exercise in memorization. It was a different kind of experience and one that turned out entertaining, if slightly repetitive. Upon first glance, Way of the Passive Fist looks like a throwback to the days of 16-bit, quarter-munching arcade brawlers. On top of the vintage visuals, it has a story to match. The story follows a mysterious warrior called The Wanderer. He is looking to save what remains of humanity on a distant planet called Zircon V from the forces of an evil dictator. The story is a cross between sci-fi and an old kung-fu flick, though it started to lose some of its charm by the end. The narrative sets up the Wanderer's conflict with pretty much any antagonist force that moves. Fortunately, many of those forces are random assortments of thugs and cult members. The idea is to withstand all of their attacks until they get tired out and they can simply be pushed over with the tip of a finger. This is where Way of the Passive Fist starts to feel more like a rhythm game. There's a large variety of enemies and all of them have their own distinct attack patterns. As more of them start to show up, the more their patterns started to turn into a song in my head. This is also where I started hitting a problem unique to this game. Because of the sheer variety of enemies, I didn't want to turn the game off and risk forgetting any of these patterns. After all, hitting high parry combos would unlock special abilities and those special abilities were often the only way to defeat the game's hardest foes. So I trudged through in an effort to put my recent memory to work, but it also highlighted just how repetitive the exercise was. This has often been the downfall of old-school arcade brawlers and a good reason why many of them haven't aged well. Way of the Passive Fist has that same weakness, because there's nothing to break up the action. There's something else Way of the Passive Fist has in common with old-school beat-'em-ups: cheesy bosses. They proved to be simultaneously delightful and frustrating. Part of the fun with them is their silly dialogue, which always culminates with a spoken voice over line that sounds like it came straight out of a B-movie. Beyond that, the bosses are well-thought out and have interesting patterns. I liked the idea of the sun cleric and the construction digger, who were like the standard rank-and-file in the sense that they had memorizable attacks. However, this is where I bumped into the other issue with the game and that's the occasional hiccups with the hit detection. Each of the bosses has attacks that can either go across the screen and back or act as a projectile. Avoiding lasers or attacks that go up and down the field is much harder than it looks. Taking a hit doesn't sound so bad on the surface, but the problem becomes that any hit breaks the Wanderer's combo. Because the Wanderer's special abilities are often the only real way to make any headway against the bosses, taking excessive hits can be an annoying impediment. There are some different ways to adjust the Wanderer's journey. In fact, Way of the Passive Fist has one of the deepest customization systems I've seen in quite a while. Controls can be completely remapped across any single button on either the gamepad or the keyboard, allowing for an increased sense of accessibility for anyone who's left-handed. The quest difficulty can be adjusted across four different categories, allowing players to adjust the number of checkpoints, number of enemy encounters, and counter timing. But where Way of the Passive Fist should be lauded is in its efforts to appeal to people with various handicaps. Flashing effects can be shut off, shaking effects can be disabled, and text size and contrast can be adjusted for anyone else with visual issues. Household Games has gone out of its way to make sure that anyone can play this game and that's an effort that shouldn't go unnoticed. 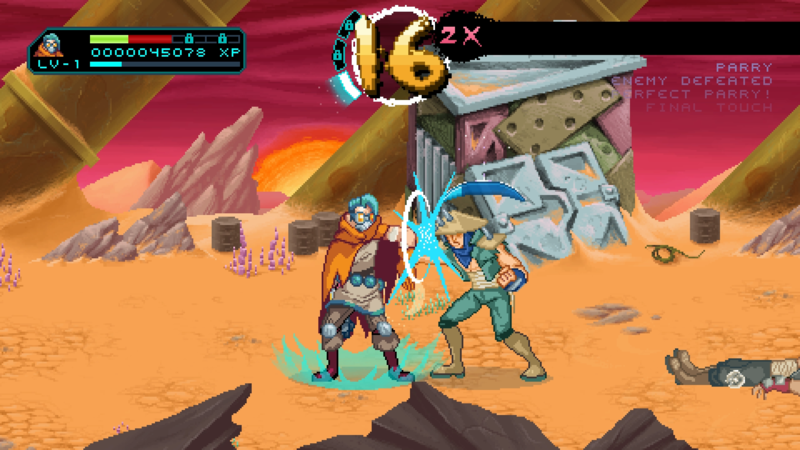 Way of the Passive Fist is an imaginative twist on a classic genre. It's fun to imagine a hero that can go through an entire warrior's journey without laying a hand on anyone… mostly. (The Wanderer's special attacks are a power punch, body slam, and gravity-powered explosion.) The idea isn't to beat everyone to a pulp, it's to rhythmically withstand everything that everyone else can dish out. But despite a reimagining, this genre shows its inherent limitations. It can get quite repetitive, even with the occasional boss battle to break up the monotony. Finishing the Story Mode unlocks Arcade Mode, but that's simply a score attack and challenge mode that just demands more of the same. Way of the Passive Fist is a fun diversion for an afternoon, with the Story Mode coming in at about four hours, but there isn't much reason to keep wandering beyond that. This review is based on a PlayStation 4 digital code provided by the developer. Way of the Passive Fist is available on Steam, the PlayStation Store, and the Xbox Live Marketplace for $14.99. The game is rated T.